Where Filipino Americans live, according to 2010 Census data. As military and humanitarian aid struggles to make its way to the areas hit hardest by Typhoon Haiyan, the Filipino American community is organizing relief supplies and efforts to contact loved ones back home. Filipino Americans are heavily concentrated in the West. Nearly a quarter of the entire Filipino-American population (24.1%, or more than 825,000 people) live in 10 Southern California counties. Almost 458,000, (13.4% of the total) live in the San Francisco Bay area, and 10% (about 342,000) live in Hawaii, where they make up a quarter of the state’s population. Other metro areas with significant numbers of Filipinos: Las Vegas, Chicago, Sacramento and Seattle. More than two-thirds (69.1%) of Filipino-American adults were born overseas. However, three-quarters (77.4%) are now U.S. citizens. Nearly half (47%) of Filipino Americans ages 25 or older have earned at least a bachelor’s degree, compared with 28.2% of all Americans in that age group. Median annual personal earnings for full-time, year-round workers was $43,000 among Filipinos, versus $40,000 for the overall population. Only 6.2% of Filipino-American adults were in poverty, compared with 12.8% of all U.S. adults. 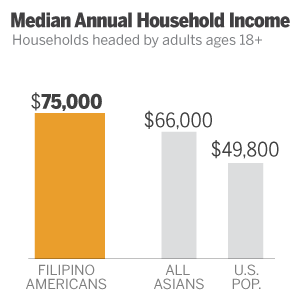 The median annual income for households headed by a Filipino-American adult was $75,000, well above the average for all Asian Americans and the U.S. population at large. But Filipino Americans also have larger households on average: 3.4 persons, compared with 3.1 for all U.S. Asians and 2.6 for the overall U.S. population. Filipinos are the second-most likely Asian-American group (behind Japanese Americans) to describe themselves as “typical Americans” — 49% do so.